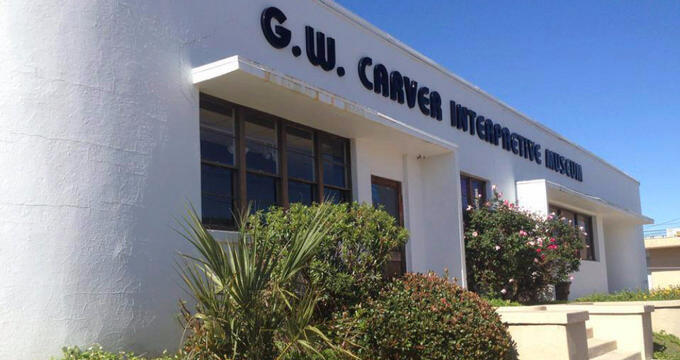 Dothan, Alabama’s George Washington Carver Interpretive Museum celebrates black history all year long with exhibits on the historic contributions of African Americans to progress in the United States, with a focus on scientists, inventors and innovators. Permanent exhibits form a timeline of American history through two separate galleries. “Designing the World We Live In” and “Black Scientists, Inventors and Explorers” are the two main permanent galleries. A Social Progress Heroes Timeline is the culmination of these two galleries and displays a timeline of the experience of African Americans in the United States. The Carver Room specifically highlights the achievements of Dr. George Washington Carver, the museum’s namesake, also known as “the peanut guy” for his groundbreaking research in the early 1900’s on improving soil conditions by alternating crops, specifically by alternating from cotton to peanuts. History: The George Washington Carver Interpretive Museum itself is housed in a historic bus station in Dothan, Alabama that once had separate entrances for “whites” and “colored” people. On display are the separate restroom facilities from the segregated Greyhound terminal. The museum is the vision of Dr. Francina Williams, who founded the museum in the year 2000. George Washington Carver was born in the 1860’s, his exact birth date unknown as was common for those born into slavery in the United States. After slavery was abolished, Carver had to travel 10 miles from his home to go to school, as blacks were not allowed to go to school in Diamond, Missouri where he grew up. Carver earned admissions at Kansas’ Highland University on the merit of his academic success, but was rejected for being black when he reported to school. He instead claimed a homestead near Beeler, Kansas and farmed for several years before attending the Iowa State Agricultural College to study botany. Carver was the college’s first black student in 1891. Carver would go on to receive a Masters of Science in 1896 and soon after became Iowa State’s first black faculty member. He shortly thereafter invited by Booker T Washington to teach at the Tuskegee Institute, where he would remain on the faculty for another 47 years. While at Tuskegee, Carver’s work focused on best practices for crop rotation, a new theory at the time. He introduced several new cash crops to farmers in the south, mainly the peanut, as a means of rotating from cotton to improve soil conditions. Carver would take a mobile classroom of his design to the fields to teach farmers about the practice. Rotating crops to restore nitrogen to soil drove Carver to fame. In the 1920’s he was invited to speak at a conference for the United Peanut Associations of America. He presented over 145 uses for the peanut as a way to encourage more peanut farming within the United States. His brochure on 105 peanut recipes was the most popular of 44 brochures he wrote over the years for farmers in the south. Ongoing Programs and Education: Tours of the museum may be self guided or guided. Field Trip programs are available for homeschooled children, senior citizens, or any organized group. Field trip activities include hands-on science experiments designed to spur interest in science, invention and exploration. Ongoing events at the George Washington Carver Interpretive Museum include art show openings for temporary art exhibits, lectures by visiting artists, historians and authors, and monthly meetings of Young People, a Christian organization. Other recent events have included Family Day, which invites parents to explore science and invention by doing crafts and Discovery Zone projects with their kids. Annual events include the museum’s Juneteenth celebration, honoring the 1865 abolition of slavery on June 19th. Celebrations involve art shows and outdoor concerts. The museum is available to be rented as an event venue. What’s Nearby: Dothan is a town of 68,000 in southeastern Alabama, the largest in Houston County. The area is known as the Wiregrass region for the wiregrass ecosystem on the Gulf coast. Things to do in Dothan include visiting the Wiregrass Museum of Art, the Dothan Area Botanical Gardens, and the Adventureland and Waterworld theme parks. Murals of the Wiregrass are a series of large-scale outdoor murals on local businesses in Dothan, each representing the history and community of Dothan.